Not Otherwise Specified, by Hannah Moskowitz (book review) – no dance, no daring, no joy? The heart and soul of a tall, willowy ballerina is firmly implanted into Etta’s short and curvaceous body. When the ballet director notes that she stands out too much in the cookie-cutter corps de ballet line, Etta spirals out of the elite dance troupe and into eating disorder group. Happy book birthday to Not Otherwise Specified! I just adore Etta and everything she does to rescue herself, to help her friends get to a better place, and to realize her dreams. This book isn’t just ‘checking off the boxes’ for diversity in ethnicity, sexual orientation, talents, and social situations – it turns a few expected tropes sideways, reverses others, and brings us a wholly unique story worth a standing ovation. How tight do you hold on to your dreams? 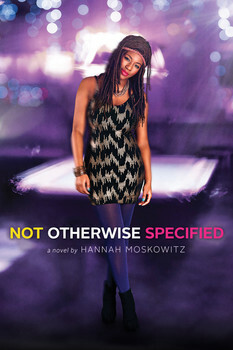 Book info: Not Otherwise Specified / Hannah Moskowitz. Simon Pulse, 2015. [author site] [publisher site] Review copy and cover image courtesy of the publisher. My book talk: Giving up food so she’d fit in the ballet corps, Etta doesn’t want to give up anything else, including a petite new friend who inspires the buxom, black, bisexual Nebraska native to audition one more time for an elite arts school. At eating disorder group, curvy and talented Etta meets wispy, fragile Bianca who doesn’t eat (at all) and sings like an angel born on Broadway. Like every musical theater geek, Etta wants to be in New York City, dreams of attending performing arts school there, but has never made it past first round of tryouts. Now, the principal of her private girls’ school recommends Etta for auditions. Wee Bianca, her equally talented big brother James, and his cute best friend Mason are trying out, too. Maybe concentrating on auditions will take her mind off the escalating bullying by the lesbian clique at school (for dating a guy…). So-called friends won’t accept that a person can change. And Etta won’t let little Bee starve herself to death, won’t let her own fears keep her from auditioning for Brentwood, won’t let the bullies force her to limit her life.